Here’s a very simple Father’s Day craft, but one that any candy-loving dad is sure to adore. All you need is a nice glass bottle, a bag of Reese’s Pieces and the printed label/tag. It’s a perfect “oh crap I forgot to get him something” craft! 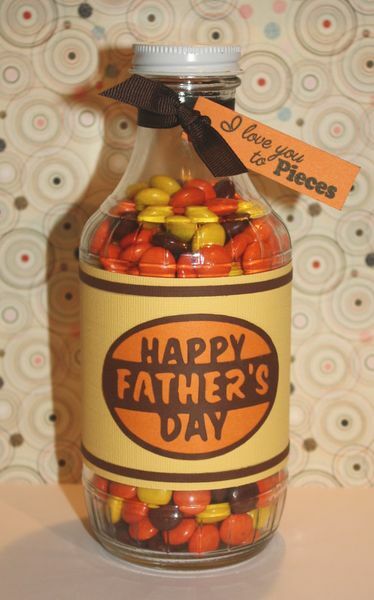 And if your dad happens to not like Reese’s Pieces, they make all kinds of other “pieces” candies nowadays, which are also different colors if you’d prefer to make this with a different color scheme. For instance, these Almond Joy Pieces are blue and white instead of orange and yellow, which would make for quite an interesting variation of this craft!